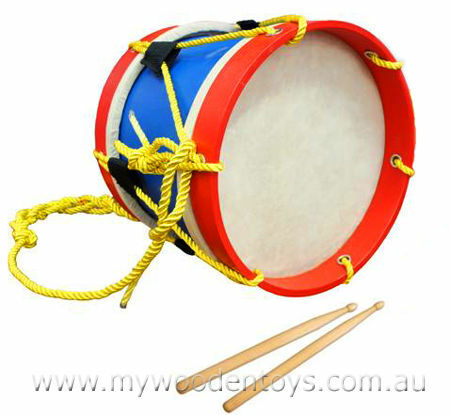 Wooden Toy Marching Drum is a beautiful traditional wooden toy drum for any little one that likes to make a noise. With two solid drum sticks this red blue and gold drum is a great way to learn how to keep a beat. This drum has a beautiful gold braid strap so you can hang it around your neck and march along to your wonderful rhythms. This drum is strong, has a very pleasing tone and has an animal hide skin. Material:Animal hide skin, Wooden Rims, Wooden Sticks, Synthetic Gold Braid Cord. We like this because: "Lovely solid quality and has a nice tone so as your little one plays it wont drive you nuts!. "